Considered to be one of the most imposing Roman ruins, Diocletian’s palace is certainly the main attraction of the city of Split, Croatia. These ruins are some of the most valuable surviving buildings of the Roman era on the Adriatic coast. Emperor Diocletian, who voluntarily gave up the throne of the Roman Empire, in the turn of the 4th century CE built the palace and after his retirement on May1, 305 settled here, on the beach, in the Illyrian province of Rome. Today the Illyrian province is part of Croatia. The so-called palace was a massive structure and contains not only the palace itself but also buildings, intended for housing military garrison. The whole complex occupied around 30,000 square meters. 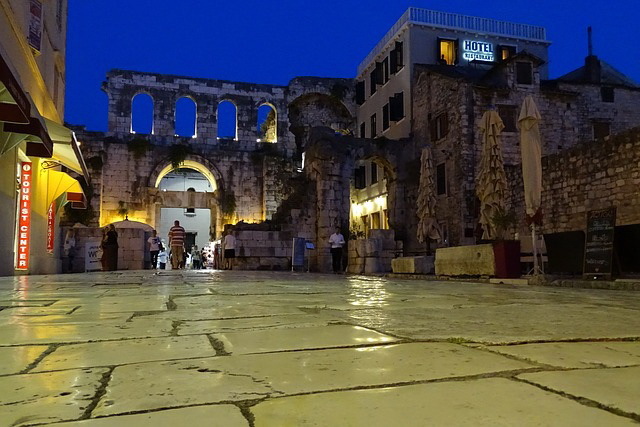 Today these ruins lie in the heart of the city of Split in Croatia. 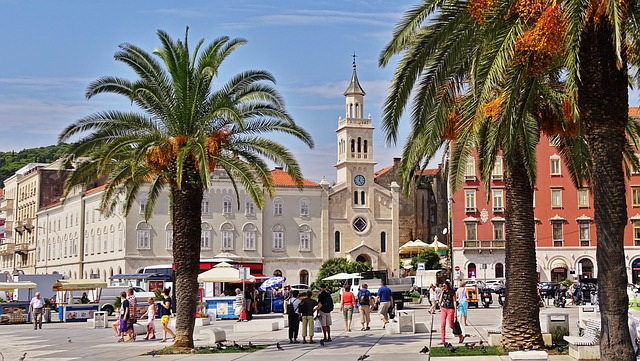 The ancient fortress has become the old town of Split, with numerous shops, cafes, restaurants and also apartments, located in the old buildings on narrow streets of the palace/fortress. Around 3000 people live on the territory of Diocletian’s palace today. Emperor Diocletian had a wish to enter his palace on a ship, without leaving the deck. Today, it is hard to imagine that the lower tier of Diocletian’s palace once was covered with water, and the ship of the Emperor was usually slowly passing between the columns and stopping among the vaulted rooms of the lower tier. The windows in the lower rooms of the palace are located near the ceiling - in case the water would rise - and even during the day the illumination here is weak, uneven. Over time, the sea receded, and a city emerged around the palace. Not much is left in Split from the era of Diocletian - only the palace, the remains of walls and gates. The rest of the old city is covered with white stone buildings of different periods and styles. The palace was built from local limestone and white marble. The palace has a form of an irregular rectangle with numerous towers on the western, northern, and eastern facades. The southern façade has no towers, because it was rising directly from the waters of the sea. The design of the palace is a mix of villa and castrum architecture. The Emperor’s apartments were located on the southern part of the complex - along the seaside. Only the foundation and lower floors of these apartments have survived to our days. Diocletian’s octagonal mausoleum (later was reconstructed into a Christian church - one of the oldest in the world) and 3 temples were also located in the southern part of the palace. One of the temples was later turned into a baptistery, the other two were destroyed. On the crossroad of the two main roads of the palace, the so called Peristyle is located. The Peristyle is a rectangular open court decorated with colonnade and intended to become the heart of the palace, where the most powerful Roman citizens were gathering. The palace had four gates. From the Golden gate on the northern side of the fortress the road to the town of Solin was starting. The Silver gate was located on the eastern part, the Iron one - on the west, and the Bronze gate was on the south - the sea shore. The gates themselves, of course, did not survive, but carved stone pillars and arches residues can still be seen on their place. Here and there in the palace one can find antiques, including three 3500 years old sphinxes, brought to Split from Egypt for the Emperor. Nowadays, during the day you can often hear music in the palace. But in the evenings the palace is particularly attractive. When the night falls, the marble and granite columns, topped by Corinthian capitals, are usually illuminated by colorful garlands, and the interiors of the palace are becoming a beautiful scene, where actors in Roman togas are performing with their solemn voices, echoing under the arches of this ancient palace.